"Halo: Fleet Battles delivers an easy to learn, lore-infused, tactically-rich gaming experience that appeals both to experienced wargamers and fans of the Halo Universe." Halo: Fleet Battles is a tabletop game developed by Spartan Games. 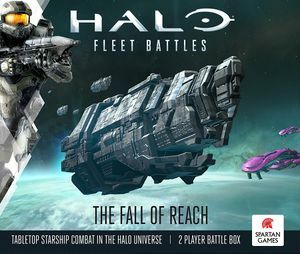 The first set for Halo: Fleet Battles, called The Fall of Reach box, was released on July 20, 2015. In February 2015, Spartan Games announced that the company had established a License Agreement with Microsoft Studios to design and produce tabletop miniatures games for the Halo series. Spartan Games worked together with 343 Industries to produce ship designs that had never visually appeared in previous canon, such as the ORS-class heavy cruiser and the Epoch-class heavy carrier. Although the company was given considerable freedom in designing the models, 343i's Franchise team ensured that each vessel properly fit their faction, role, and established canonical details. Those who pre-ordered at Salute 2015 or the Spartan Games online store on April 25, 2015 received a bust of their choosing between Vice Admiral Michael Stanforth and Supreme Commander Rho 'Barutamee. Those who attended GenCon in Indianapolis, USA, from July 30 to August 2, 2015, were able to purchase a special edition of the Fall of Reach box, which included for free alongside the normal contents $40-worth of models: one extra UNSC large sprue (one Epoch-class Heavy Carrier and three Paris-class Frigates), one extra Covenant large sprue (one ORS Class Heavy Cruiser and two SDV -class Heavy Corvettes), one extra fight stand sprue, and more token sheets; this offer was also available during GenCon on the Spartan Games online store. Available August 26, 2015, this boxed set serves as an introductory set for UNSC commanders. The contents consist of a full color 128-page Core Rulebook, Vice Admiral Michael Stanforth Data Sheet, five UNSC Command Dice, two Six Sided Dice, Token Sheets, a UNSC Statistic Sheet, and a Reference Sheet. Available on August 26, 2015, this boxed set serves as an introductory set for Covenant commanders. The contents consist of a full color 128-page Core Rulebook, a Supreme Commander Rho 'Barutamee Data Sheet, five Covenant Command Dice, two Six-sided Dice, Token Sheets, a Covenant Statistic Sheet, and a Reference Sheet. Available on August 26, this boxed set can serve either to upgrade a Halo: Fleet Battles UNSC force with additional medium and small firepower or to act as the foundation for a new UNSC force. The contents consist of twenty eight models (four Marathon- class Cruisers and twenty four Paris- class Frigates, three Formation Base Sprues (twelve bases in all), four Ship Overlay Sheets (twenty four Ship Overlays), two Token Sheets, two Statistics Sheets, and one Assembly Guide. Available on August 26, this boxed set can serve either to upgrade a Halo: Fleet Battles Covenant force with additional medium and small firepower or to act as the foundation for a new Covenant force. The contents consist of fourteen models (two CCS battlecruisers and twelve SDV corvettes), two Base Formation Sprues (eight bases in all), three Ship Overlay Sheets (eighteen Ship Overlays), two Token Sheets, two Statistics Sheets, and one Assembly Guide. Available on August 26, this boxed set can serve either to upgrade a Halo: Fleet Battles UNSC force with additional large firepower or to act as the foundation for a new UNSC force. The contents consist of eight models (two Epoch carriers and six Paris frigates), one Formation Base Sprue (four bases in all), one Ship Overlay Sheet, two Token Sheets, one Statistics Sheet, and one Assembly Guide. Available on August 26, this boxed set can serve either to upgrade a Halo: Fleet Battles Covenant force with additional large firepower or to act as the foundation for a new Covenant force. The contents consist of six models (two ORS-class crusiers and four SDV-class corvettes), one Formation Base Sprue (four bases in all), one Ship Overlay Sheet (six Ship Overlays), two Token Sheets, one Statistics Sheet, and one Assembly Guide. This set contains new leadership cards that enable the use of new formations and new abilities for any UNSC fleet. This set includes two ship overlay sheets (twelve ship overlays), one statistics sheet, five command dice, one Fleet Admiral Terrence Hood Commander Card, and one Cortana Heroic Character Card. This set contains new leadership cards that enable the use of new formations and new abilities for any Covenant fleet . This set includes two ship overlay sheets (twelve ship overlays), one statistics sheet, five command dice, one Xytan 'Jar Wattinree Commander Card, and one Minister of Etiology Heroic Character Card. The contents of the Fall of Reach box. Some of the UNSC ships in Halo: Fleet Battles. Some of the Covenant ships in Halo: Fleet Battles. A pair of Valiant-class super-heavy cruisers alongside an Epoch, a CAS-class assault carrier, and various other vessels. Pre-order advertisement for the busts. Placeholder image for the game's box. A CAS-class assault carrier leads a Covenant fleet against a UNSC fleet. An Epoch-class heavy carrier leading the UNSC Pillar of Autumn and Paris-class heavy frigates. Various figures, cards, tokens, dice, and a bust of Rho 'Barutamee. A Marathon-class heavy cruiser leading a group of Paris-class heavy frigates. The Rho 'Barutamee bust with dice. The Michael Stanforth bust with dice. The Michael Stanforth card with an Epoch-class heavy carrier. A Punic-class supercarrier with several Marathon-class cruisers and Paris-class frigates. Models for the Valiant and CPV. A side view of the CSO-class supercarrier. A front view of the CSO-class supercarrier. The front of the UNSC Commander Pack. The back of the UNSC Commander Pack. The front of the Covenant Commander Pack. The back of the Covenant Commander Pack. The front of the UNSC Core Upgrade Box. The back of the UNSC Core Upgrade Box. The front of the Covenant Core Upgrade Box. The back of the Covenant Core Upgrade Box. The front of the UNSC Large Upgrade Box. The back of the UNSC Large Upgrade Box. The front of the Covenant Large Upgrade Box. The back of the Covenant Large Upgrade Box. Various ships in the game. The UNSC Command Upgrade Set. The Covenant Command Upgrade Set. The busts of Rho 'Barutamee, Xytan 'Jar Wattinree and the Minister of Etiology. Concept art of various destroyed UNSC ships. ↑ 5.0 5.1 5.2 YouTube: Weekender: Halo: Fleet Battles Special! ↑ Spartan Games: Halo Waypoint Update with Spartan - NEW SHIPS!